Twice he’s touched the roof of world, reaching the highest summit on seven continents. Before that, he became the first Westerner in 50 years to cross the Empty Quarter of Arabia, the world’s biggest sand desert. 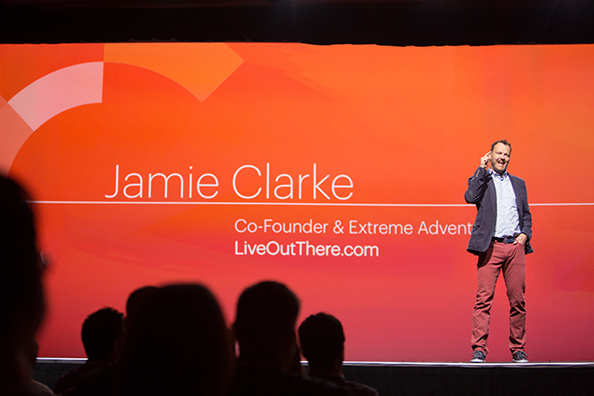 Adventurer, author, filmmaker and CEO, Jamie is the main keynote speaker at Think INSIDE the Box 2016. The event showcases cutting-edge strategies to maximize your direct marketing impact. In 2002, Jamie opened a retail store in Calgary, selling products he personally puts to the test on his trips around the globe. Six years ago, he launched an e-commerce operation to sell a range of active lifestyle products to shoppers across Canada. His business, LiveOutThere.com, was recently ranked one of Canada’s 50 fastest growing companies by both Profit Guide and Alberta Venture magazines. – he also was nominated for Canada Post Ecommerce Award – should we mention here also? Jamie’s compelling and passionate presentation will illustrate the lessons his life as an adventurer has taught him about being a better marketing leader. Here’s a sneak peek at some of his advice. Cut down on complacency and get the quality you want by giving projects the time and attention they deserve. Sitting on a decision too long can end up being costly. While it’s not wise to be hasty, you need to make up your mind. Day-to-day details can cloud your vision of your ultimate goals. If you want to realize them, make sure you don’t lose sight of what’s required to get there. Serious business doesn’t always have to be serious. Have fun with your work mates, and don’t get too down when times are tough. Come see Jamie and others at Canada Post’s Think INSIDE the Box Direct Marketing Conference. Contact your Canada Post representative or Register online today.